The root meaning of the word creative is ‘to grow’ and our retreats support and nurture that process on many levels. Happiness is making mandalas! Bali mandala group. Mandala Magic has designed a special retreat for balancing the mind/body/spirit connection intuitively and creatively. Discover a sense of wholeness and wellness on all levels in the perfect environment of Bali. We want you to experience the uniqueness of Balinese culture and not the artificial world of a resort and yet still be comfortable, relaxed and nurtured. Your local hosts are a family who love and support their country, its traditions and sacredness. Set in the heart of Ubud you are free to easily access all that this village has to offer. Workshops will take up most of your days, however there is time to relax, reflect and absorb with a day to your self nicely spaced to enjoy a pampering experience (included) or explore more of Bali. Optional added extra - a visit to a traditional healer and Sharman. INVESTMENT: $1880 8 nights & 7 days SMALL GROUP. BOOKING NOW!! 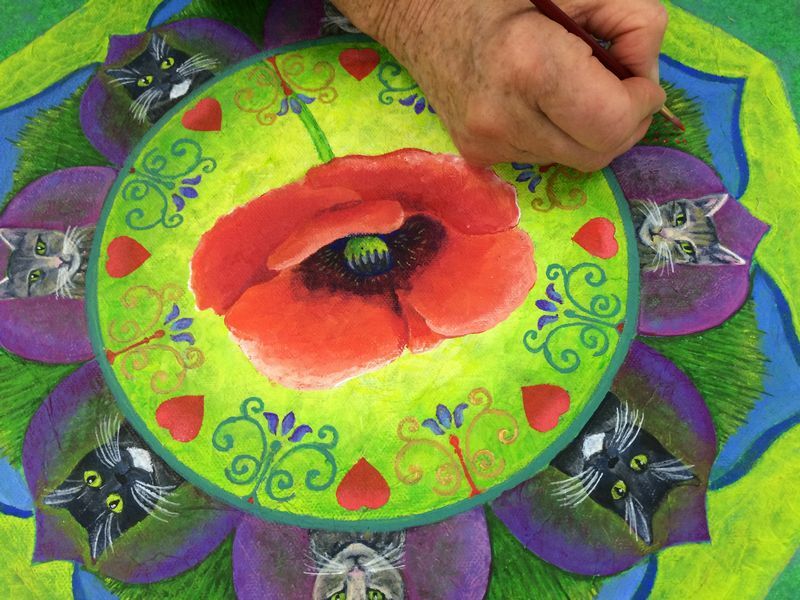 Making a mandala is the beautiful and magical process of unfolding our creative potential that lies naturally within. Balinese Banquet Ubud only - Megibung. Selection of traditional dishes meat, vegetarian, spicy and mild. Our gift of a massage, facial or manicure. LOYALTY discounts to those returning to Bali with Mandala Magic . PAYMENT PLAN AVAILABLE: Deposit $500 and make monthly payment after that. EXTRA - If you want to stay on in Bali for a couple of days or a week and are not sure what to do, join up with Diane of Bali Bubble who loves and has lived in Bali for several years. Diane is a bubbly personality who will really look after you. Experience a "Taster Tours" & what Bali has to offer. DATES: Arrive 21 September - 29 September SMALL GROUP ONLY. COST: $2080 ABSOLUTE BARGAIN! Only 2 places left so be quick. Elysabeth, Christiane (residents) and Gary give their heart support welcoming you and making this retreat something special in the ancient Village of Villemur Sur Tarn and the small Provencal village of Les Fillols(bottom right). Gary stands at the entrance of our art space in the beautiful historical building of Le Granary Du Roy. 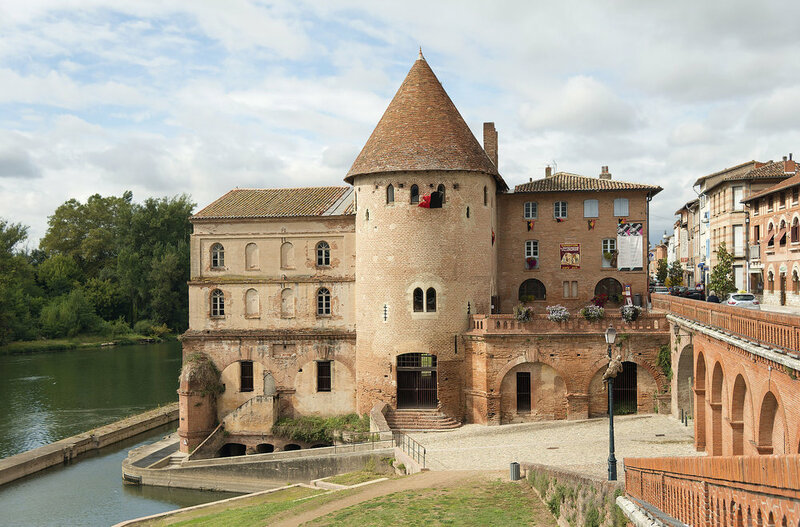 Mandala Magic offers you an art experience in France. WHAT TO DO NOW : Contact us by email. Your place is secured by a non refundable deposit of $500. A comprehensive travel pack with tips on health and medical advice for travelling in France, answers to frequently asked questions and a list of what to pack is sent on receipt of your deposit. We also send a detailed itinerary and as experienced travellers know how to look after you. 10 DAY BALI ART AND WRITING RETREAT - AWESOME! Writing, in all its varied forms, is an empowering and complex process. It calls upon the writer to bring together the random thoughts in his left and right parts of the brain and shape them into something useful, beautiful and inspiring so that another person can understand it. It is a creative way of sharing. Karen Scott Mandala artist and experienced retreat facilitator and Rachel Nightingale, author of the Tales of Tarya trilogy (Odyssey Books) are excited! They have been on a long and amazing journey through creating, healing and friendship for many years of exploring and expressing the creative spirit. Now they want to share that experience and knowledge with you in beautiful Bali. During your 10 day Bali retreat you will be working closely with both of them as they guide you through your own personal creative journey of discovery and expression with workshops in writing, mandala making, daily journal work, Soul Journal making , visualisation meditations and more. You will leave with a written story, a mandala that you have created, a visual Soul Journal, a journal full of inspiration and ideas for writing, and an overall sense of well being and personal connection after 10 wonderful days in Bali. WOW! Your stay will be in a beautiful, simple setting with your own double bedroom and private bathroom with daily freshly prepared breakfasts. Your accommodation is owned and run by a traditional Balinese family who are happy to share their culture and love of Ubud with you. You also have the luxury of being right in the heart of Ubud close to some of the best and varied foods that Bali has to offer…and more. Workshops will take up most of your days, however there is time to relax, reflect and absorb with two days to your self nicely spaced to enjoy a pampering experience (included) or explore more of Bali….perhaps a day trip to the beach? This retreat is planned to connect with the famous Bali writer’s festival for those wishing to attend. · Balinese Banquet - Megibung. Selection of traditional dishes meat, vegetarian, spicy and mild. · Our gift of a massage, facial or manicure. · LOYALTY discounts to those returning to Bali with Mandala Magic . TERMS AND CONDITIONS of our retreats. Any deposits from you are non-refundable. Price of tours can only be guaranteed once we receive full payment. Upon your provision of your payment information, you are authorizing us to make the payment arrangements and contract with the corresponding Suppliers. Our general practice is to send information and documents to our customers electronically and via text messages whenever possible. Your contract with your Suppliers may allow them to cancel or amend bookings. As your Booking Agent, we will ensure that you are promptly notified of any significant changes once we become aware of such change if there is time before your departure, but we accept no liability for any changes or costs incurred that may result. Subject to the Supplier’s terms and conditions, you will then have the choice of accepting the change of arrangements, accepting an offer of alternative travel arrangements if one is made available by the Supplier, or canceling your booked arrangements and receiving any applicable refunds. We do not guaranty that any refunds will apply. We have no control over airline schedule changes and accommodation and accept no liability for costs which may arise as a result of such changes. Liability - As Mandala Magic is only acting as an agent we have no liability in respect of the supply of any element of your booking, including any liability for illness, personal injury, death or loss of any kind, delay and inconvenience caused directly or indirectly by any provider of travel services or products or by other third parties. Any claim for damages for injury, illness, loss or death must be brought against the relevant supplier of the travel services or products. Force Majeure - Mandala Magic shall not be liable for any loss or damage incurred by you as a consequence of Mandala Magic or any of the suppliers being unable to perform its obligations under your contract(s) due to the unusual or unforeseeable circumstances (a “force majeure event”) beyond the control of the party affected by the force majeure event. Travel Insurance - Mandala Magic incists that you take out comprehensive travel insurance at the time of paying a deposit. The policy should provide cover for loss of deposit, cancellation and additional expenses, medical expenses and repatriation and loss or damage to baggage and valuables. You are responsible for making any special or increased insurance arrangements which you deem are necessary. The root meaning of the word creative is ‘to grow’. Making mandalas is a growth process - on many levels.